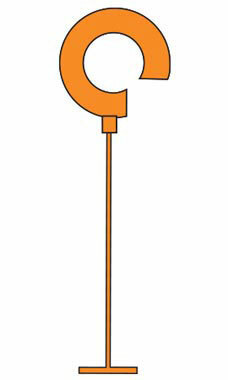 If you've got a wall for peg-hooked items, our 2" Orange Hook Fasteners will come in handy! Apply the Hook Fasteners to apparel or clothing, especially items bulked together, like socks. Featuring a hook on the end, the merchandise can then easily be placed on peg hooks. Use the 2" Hook fasteners with any regular tagging gun, including the Store Supply Warehouse regular tagging guns, for easy application. Sold in boxes of 5,000, you'll be hard pressed to run out of these fasteners quickly!